Earlier this week, we examined the trends in the major categories of startup investment including eCommerce, Software, Social Networking and Education. But which lesser known startup sectors are starting to raise venture dollars? Where are founders finding unique opportunities to innovate? Bitcoin is the fastest growing sector followed by photo sharing and physical storage (which includes moving and self storage companies). Each year, starting in mid-2012 through mid-2015, these sectors have grown their investment dollars by more than 145%, according to Mattermark data. The rest of the list controverts the notion that startups and investors pursue only incremental innovations. Space travel startups look to conquer the final frontier. In addition, founders have raised capital to transform many of the fundamental industries: transportation, hospitality, lending, health insurance, and banking. But, photosharing, inevitably, continues to grow quickly, too. 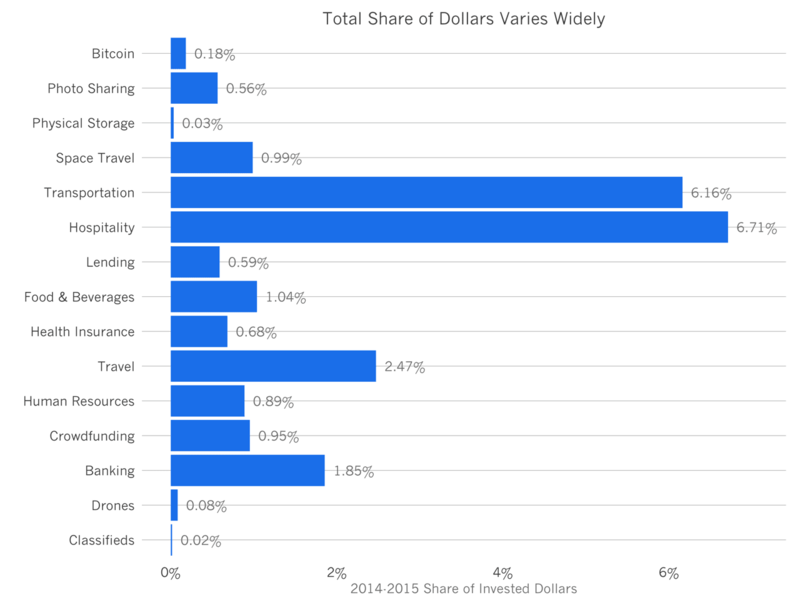 If we examine the relative share of dollars raised in the last 12 months by each of these categories, we observe that quite a few like bitcoin, physical storage, drones and classifieds represent a minuscule fraction of the total invested dollars - less than 20 basis points. Others, like transportation and hospitality, fueled by Uber and AirBnB fundraising efforts, command more than 6% of the billions invested in the last 12 months. Let’s look at the sectors with negative growth rates, where startups are raising less money over time. Semiconductor investment fell 31% per year. Email startups raised 22% less. Dating contracted by 9% annually. And the worst performing category: deal sites, whose total raised fell by 48% per year. In some cases, the causes for contraction in these categories is evident. Groupon dominates the deal market, and so room for new entrants is scarce. Semiconductor startups are constrained by a very small number of foundries who can manufacture their equipment, and compete with incumbents like Intel and TSMC, whose massive balance sheets can finance cutting edge research. Email and dating’s decline are less obvious. Nevertheless, we should continue to see a greater variance in areas of startup investment over the next few years. As the total amount of venture capital rockets toward historic records, founders will pursue areas of lesser competition, where differentiation is easier consequently creating an advantage for the company when recruiting talent and raising capital. In addition, investors will seek under-explored areas to finance, looking for great returns.